A long Spanish tale of bourgeois misrule and corruption came to a head on 1 June this year when the incumbent Prime Minister, Mariano Rajoy, of the Popular Party (PP) lost a vote of no confidence by 180 votes in favour of the motion to just 169 against, and 1 abstention. The mover of the victorious vote of ‘no confidence’, Pedro Sánchez, leader of the Spanish Socialist Party (PSOE) was put into the position of Prime Minister, and, on 5 June, Rajoy formally resigned as leader of the PP. Rajoy and other PP leading members had wriggled out of, horse-traded and side-stepped numerous accusations and even lawsuits taken to the Spanish Supreme Court over many years but it was the tediously long investigation into the ‘Gürtel corruption scandal’ that finally caught up with and ensnared them. This was one of the largest corruption scandals in recent Spanish history, which came to public attention in early 2009, but for the most part the suspects were not put on trial until October 2016. In 2011 when the PP won a majority in the lower house, Rajoy was designated Prime Minister in the Congress and, standing on a platform of austerity, was chosen by Parliament with 187 votes in favour, 149 votes against and 14 abstentions, receiving the support of his own People’s Party and both the Forum of Asturias (FAC) and the Navarrese People’s Union (UPN). By 2013, on 4 January in fact, charges were brought against Mariano Rajoy and 62 PP deputies (including four ministers) in the Supreme Court. They were accused of ‘diversion of public funds and misappropriation’. Mariano Rajoy himself was accused of receiving a subsistence allowance despite the fact that he was residing in the Moncloa Palace in Madrid, a fact he could hardly deny. The lawsuit came as a direct result of data that had appeared in the Spanish media regarding several deputies who had houses in Madrid but who claimed extra funds for lodging. According to the association DRY, association Democracia Real Ya, these public representatives, who could obviously stay at their own property at no cost at all to the public, were paid a monthly subsistence allowance valued at €1,823.36. Ironically, if they had been elected by the constituency of Madrid and had a house in that city, they would only have been allowed €870 a month to cover accommodation and food expenses. Rajoy, of course, already had all his expenses covered from the state budget and he was officially housed in the Moncloa Palace. DRY was demanding that these overpaid representatives of the Spanish people who were suffering stringent austerity cuts at the hands of their representatives, return all the money that didn’t belong to them, saying that this should happen especially as "the cuts are making most Spaniards’ life a misery”. It took until 24 April 2013 for the Supreme Court to reject the lawsuit on the grounds that they could find “no irregularity in the existing regulation”! The Spanish newspaper, El País on 30 January 2013 released a series of documents entitled the ‘Bárcenas’ secret papers’, a reference to the accounts of the PP from 1999 to 2009. These hand-written documents revealed that Mariano Rajoy and María Dolores de Cospedal had both received extra payments in ‘black’ money from the former Treasurer of the People’s Party, Luis Bárcenas. These documents proved that both Bárcenas and the previous Treasurer, managed cash donations from businessmen and private builders (three of these are also accused in the Gürtel scandel), which were sources of undeclared income for the PP. Apart from normal allocations needed for the effective functioning of the party, the documents reveal large and numerous payments made to members of the leadership of the party during those years for no explicitly stated purpose. The Bárcenas’ accounts show yearly payments of 25,200 euros for 11 years to the Party President, Mariano Rajoy. Other leaders of the PP also gained generously from this ‘black’ money. On 8 July 2013, the newspaper El Mundo, which is usually a supporter of the PP, published an interview with Luis Bárcenas which had taken place a few days before he was jailed on 27 June. In the course of this interview, the former PP Treasurer revealed that the People’s Party had been illegally financed for 20 years! El Mundo followed this up by publishing the originals of Bárcenas’ papers which showed that those extra payments to Mariano Rajoy also happened in 1997, 1998 and 1999, when he was a minister in the cabinet of Aznar (the previous Prime Minister). These payments were definitely in violation of the ‘Incompatibilities Act of 1995’. Then, to finish the job, on 14 July El Mundo published several text messages which had passed between Rajoy and Bárcenas, one as late as early 2013, after the discovery of Bárcenas’ bank accounts in Switzerland and after journalists had discovered and published evidence of the illegal payments within the PP. In these messages which El Mundo was putting before the Spanish people and the judiciary, Rajoy expressed his support for Bárcenas and asked him to keep quiet! 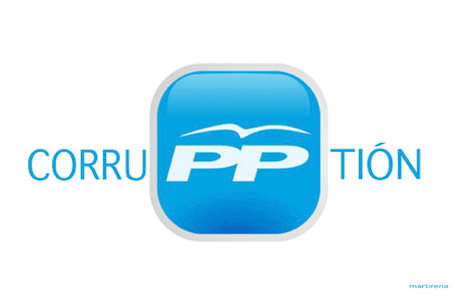 With all this evidence in the newspapers, the High Court judge, Pablo Ruz, officially summoned the PP ex-Treasurer, Bárcenas, to appear before him on 15 July 2013. Bárcenas admitted to the court the payment of 50,000 euros in 2010 to Rajoy and Dolores de Cospedal. The opposition parties urged Rajoy to give an explanation to parliament, and the Spanish Socialist Party threatened to lodge a censure motion against him demanding his immediate resignation. Rajoy went before Congress on 1 August and admitted that he had made ‘a mistake’ in trusting Bárcenas and he criticised the opposition for trying to ‘criminalise’ him by believing the word of an ‘offender’ over the word of the Prime Minister. He stated that he would neither resign nor call a new election. Rajoy also stated that Bárcenas was no longer a member of the PP when he, Rajoy, was appointed prime minister (in December 2011). However, El Mundo ws able to bring forward documents proving that, not only had Bárcenas been ‘re-incorporated’ into the PP just days after being removed as the Treasurer, but that he had also written to Rajoy to tell him so. By 26 November 2014, Ana Mato, the Minister of Health, resigned owing to the involvement of herself and her husband in the Gürtel scandal. Rajoy was called to give evidence in the Gürtel scandal case where he testified in Audiencia Nacional as a witness in the investigation into the illegal financing of his party. Although he personally benefited from this corruption scheme, he denied any knowledge of it. A no-confidence motion against Rajoy’s government was brought in the Spanish parliament and debated on 13 June but was defeated on 14 June 2014. The 2015 general election on 20 December was set against the background of sleaze from the ruling party which Rajoy seemed to be able to just walk away from by denying any wrong-doing. The results showed that the People’s Party were still the most voted-for party, but only just. It had lost 64 of its 187 seats and seen its comfortable majority disappear. The election produced a hung parliament which led to another election in 2016, as neither Rajoy nor the opposition could cobble together a working coalition government. That general election of 26 June 2016 saw the PP increase its number of seats, but it still fell short of an overall majority. However, on 29 October Rajoy was re-appointed as prime minister, thanks to the majority of PSOE members deciding to abstain in the parliamentary vote rather than oppose him on the grounds that they and, indeed, bourgeois democracy in general, would look pretty pointless to the masses if it did. On 1 October 2017, an illegal referendum took place in wealthy Catalonia where the local bourgeoisie saw an opportunity to cut themselves loose of all the poorer districts of Spain and set themselves up as a new republic. Instead of debate and getting the Spanish working class behind the argument for keeping Spain together for the sake of all, Rajoy gave orders for the police to stop the voting and the whole thing descended into chaos and violent street clashes, while the world watched open-mouthed wondering how it had got to that stage. The constitutional crisis did give Rajoy and other PP leaders a breather from the legal whirlwind descending on them, and he got the chance to play the victim who just had to fight back. The imposition of direct rule in Catalonia on 27 October 2017 probably did as much damage to the Catalan separatists as it did to the PP, as ordinary working people in Catalonia, whether they had strong views on Catalan separation or not, did not appreciate the troubles that descended on them. And so to 2018! The first definitive court ruling on the Gürtel corruption scandal saw the conviction of a series of former PP party officials. Former treasurer Luis Bárcenas was sentenced to 33 years of prison and a fine of 44 million euros for hiding a fortune (they still do not know just how much) in Swiss banks. It has now been proven that there was a "network of institutionalised corruption" and that the PP "financially benefited" extensively from the Gürtel affair, something for which that party was fined 245,492 euros. The court ruling also considered that it was now proven that the PP had had a secret slush fund since 1989, consisting of a "financial and accounting structure that was parallel to the official one". This is only the start of the rulings as this one only covered the 1999-2005 period of the Gürtel scandal. The PSOE can take no pleasure in removing Rajoy by these means. Highlighting corruption not only affects the party that is being exposed within bourgeois democracy, it also highlights the sordid and anti-working class nature of bourgeois democracy itself and all the other parties that champion it, whatever they may call themselves. The enlightenment does not stop at the Spanish border either, as the rottenness of the dictatorship of the bourgeoisie is to be seen on show all across Europe. Every case must be highlighted by us and placed before the workers, demonstrating that this is the reality of bourgeois democracy/dictatorship (it means the same thing) wherever it misrules us. It must be destroyed and swept away by us for it will not go away by any other means except, of course, the destruction of the entire human race!